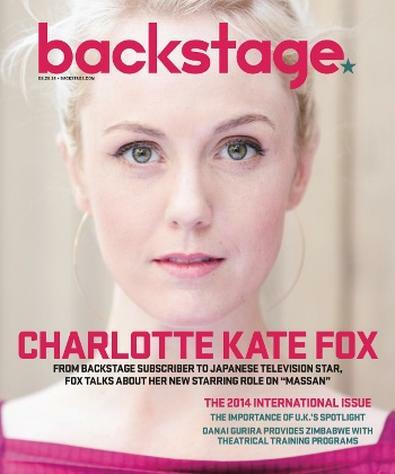 Charlotte Kate Fox’s big break came courtesy of an icon in Japan. When Fox submitted for the role of Ellie in the Japanese television drama “Massan,” about the founder of Japan’s whiskey industry, Masataka Taketsuru, and his wife, she had no idea that she had taken the first step in a journey that would involve flying halfway across the world, appearing in major press conferences, and becoming a household name in a country where she didn’t even speak the language. And all because she took a shot on a Backstage casting notice. We spoke to Fox—hard at work filming the series in Japan—about being brave as an actor, being inspired by the real-life woman who inspired her character, Ellie, and the universality of listening. Ellie is based on Rita Cowan. Although the integrity and structure of Rita’s life story remain, Ellie is a completely different character, so I have not been strictly bound to adhere to who Rita was. Ellie is wonderful. She is sort of Doris Day–like, in the fact that she always, always sees the best in people and in situations. I love getting to experience “newness” with her. In a way she is childlike, as she is learning everything for the first time. The language, the customs, the cuisine, and of course what it is like to be married to someone from another country. That is not to say that she is not strong. She has a deep love and belief in her husband and his dream. She supports him through incredible hardships. She always stands up for what she believes in and is not afraid to show her emotions, which is sometimes problematic in Japan. She is dynamic and funny and has a diamond-like perseverance. She has this effervescence about her, this bubbly yearning to know, to understand, and to ultimately support and foster friendship and love between people. Her patience is godlike—and I hope a little of that wears off on me! What prompted you to submit in the first place? I think oftentimes, actors see casting call notices that look and sound amazing, but we don’t submit because it either sounds too good to be true or we’re scared or we think, There’s no way I could land that, and we let it go. I remember reading the notice and thinking, Wow. That sounds incredible: a period piece to be shot in Japan, spanning the lifetime of a unique woman. Then I think I left it alone for a day, because I had to look for a day job. Bills had to be paid, rent due—the practical part of my brain took over. I think later that night I was sitting on my couch, sifting through the Backstage notices again, and I came back to the casting call and I thought, Why not? You never know. Be brave, Charlotte. Don’t just dream, do! So I submitted, and the next day went back to my temp job. We’re always doing that, us actors. I love that. Our resilience. Juggling dreams and artistry with practical life and practical jobs. I think that’s what makes us so strong. We are always living in two different worlds. Were you surprised that they responded to you? I was surprised and honored! The casting director was Yoko Narahashi, who is very respected both in the U.S. and in Japan. But again, the gravity of the situation had not sunk in. I still thought, I know I can do this, I know I want to do this, but there are so many women. (Because of course the audition notice was issued in three countries.) But I went back to my training, back to the craft, back to meanings, and I prepared my audition piece and submitted. It’s so amazing to think what technology has allowed us actors to do by ourselves. My materials were received by Yoko and sent across oceans. All filmed in my tiny apartment in Illinois! It’s still amazing to me. At what point did you realize that you’d be going to Japan? Other than working to learn the language, what other preparation have you done? I read everything I could get my hands on about Rita and her husband. Dr. Robert Schneider (a mentor and the head of my thesis committee) helped me gather research. Also, I was able to visit their home and museum in Hokkaido, which was incredibly humbling. The training I received from Northern Illinois University has been invaluable. I owe them so much. Stanton Davis, my voice teacher, will be happy to know my IPA skills are used for the Scottish dialect, and I also use it for difficult words in Japanese. Deborah Robertson and Patricia Skarbinski, my movement teachers, taught me how to utilize my body and voice to find where Ellie lives, where she originates from, how she leads with her heart and struggles to fit into a “water world” as she has such an “air-y” quality. Alex Gelman taught me to always ask myself, “What is it really like? We know what the words mean, but what are we really talking about?,” which is so useful when I am speaking a language I don’t know; constantly asking myself that question always leads me back to the true humanity of the show, of the characters, and of the situation. And, of course, Kathryn Gately has helped me to listen and respond truthfully, among many, many other things. Most of the time I don’t understand every word my partners say to me, but when I listen with my whole self, I am able to understand their body, their voice, their heart, and their eyes, and I can respond truthfully. I make sure my meanings are in place, that they carry enough weight, and that the stakes are always high. I also do incredible amounts of activity work on the show: making rice, hanging laundry, scrubbing floors, preparing Japanese food. It’s really an amazing chance to practice what I have learned from these gifted teachers. 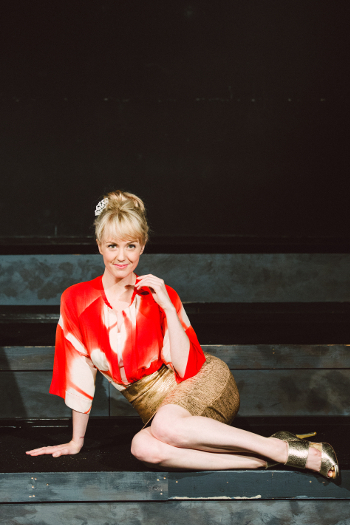 Have your fellow cast members prompted any changes in your acting style or method? Tetsuji Tamayama is playing my husband, Massan. And he has been such a lovely partner to work with. In the beginning, there was also a lot of pressure on both of us to make this “work.” And because of the nature of the show and how quickly it began and how quickly it shoots and how often we shoot, we didn’t have much time to build our relationship as deeply as we both would have liked. But now that we have been filming for a month or so, we are finding our own special way of communicating. For example, looking people in the eye is a very American actor trait (and perhaps even more of a Meisner-trained actor trait) but in Japan, you often turn away and don’t look at your partner’s eyes, especially in a very emotional scene. Both work. Neither one is the only way. There is no one road to truth, no one technique, no one method. Both Tamayama-san and I have found ways to listen to each other that don’t require either of us to sacrifice our own technique, but rather we get to adapt and adopt each other’s different ways of working. At the very least, all of my partners have helped me to become a better listener. By default of not knowing the language fully, I have had to become more open and more responsive. I think, ultimately, that is what all actors always aim for. So I am very thankful to them for that gift.